Our mission is to provide children facing adversity with strong and eduring, professionally supported 1-to-1 relationships that change their lives for the better, forever. 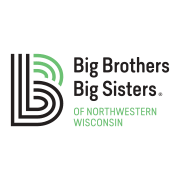 Big Brothers Big Sisters of Northwestern Wisconsin serves 9 counties: Chippewa, Dunn, Eau Claire, Oneida, Pierce, Price, St. Croix, Taylor, & Vilas. We offer 2 different mentoring programs - Community-Based & School/Site-Based. We were established in 1972 as a Kinship organization and became a Big Brothers Big Sisters affiliated organization in 1995. Would you recommend Big Brothers Big Sisters of Northwestern Wisconsin?